"I needed power...I didn't care if it came from [...] the devil. I happily joined hands...If I could attain that power, I vowed to defeat my opponent, even if they happened to be a god! And you people are no exceptions!" "Wash away all vice in the flow of a furious flood. Its name is righteousness! I ride Blue Storm Dragon, Maelstrom!" Anime Biography: The son of a mysterious family shrouded in rumor, Leon is an enigmatic figure who claims to be directed by "the wind." First appearing in card shop PSY to fight the world-famous Daigo, Leon is immediately recognized for his use of the legendary clan, Aqua Force. An unrivaled clan that had long ago conquered the world, Aqua Force vanished into myth much like the Royal Paladins that would go on to follow it in recent times. The Souryuu family however, continues to wield this clan even today. 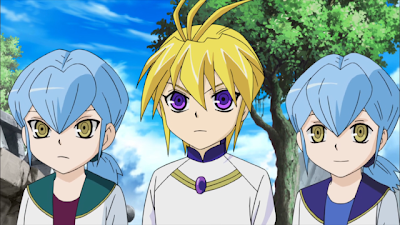 Leon is also the leader of Team Dreadnought, with the twin sisters Gillian and Charlene as his teammates. Spoiler warning: Asia Circuit details follow. Upon meeting him, Kourin immediately identifies Leon as someone possessing "the new power." Suiko does not know of him personally, nor does she know if he possesses this "new power," but seems to recognize his surname, suggesting that she is well aware of the Souryuu family's use of Aqua Force. "He" seems likewise aware of the family, as their past relation to Cray is mentioned briefly toward the end of season 1. Leon makes continuous reference to "the wind" both in his fights and out, and is able to tell when his final turn has come while fighting Daigo based on the wind "stopping." This wind that Leon speaks of is in fact his own extremely powerful PSY Qualia, evolved to a level on par with Suzugamori Ren's. 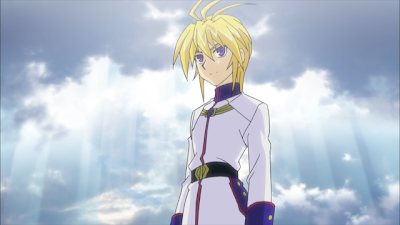 Unlike Aichi, Leon is able to use his Qualia outside of battle, using it to determine where he should go next to achieve his goals and who his allies will be at any given moment. Following his defeat of Daigo, Leon states that he intends to fight Aichi in the future, and makes this aim a reality at the Hong Kong stage of the VF Circuit. Leon's true nature is as the legendary savior of the Souryuu people, an ethnic group that in the ancient past dominated the seven seas with the power of their mysterious "Aqua Force" power. In reality, their fate was directly connected to the Aqua Force clan on Cray, and when that clan was subjugated by an outside party, the Souryuu people's own power was shattered and they were forced on a mass exodus away from the seven seas. Driven into a single ruined fortress, they survived on the brink of destruction for years as their population dwindled down into a small chain of family lines, what is known today as the Souryuu family. From generation to generation, the Souryuu family handed down the true nature of Aqua Force, and along with it a legend of a child whose life would coincide with the appearance of a star in the "eastern sky"--that of Japan. Leon was raised as this savior, and when this star appears toward the end of season 1, he embarks on a journey to revive the Souryuu family, manipulating Earth's relationship to Cray by cardfighting with what remains of the Aqua Force clan to free them from their sealing on Cray. By shaking the Earth with their appearance, Souryuu is able to gradually loosen their bonds and empower the Force, in turn bringing prosperity back into the hands of the Souryuu family. Leon cardfights with an Aqua Force deck, attacking with each unit in a specific order to trigger their skills in turn. Battle Siren, Dorothea is used to empower his vanguard, primarily Navalgazer Dragon, whose limit break activates with the same timing as her, creating a 26000-power column that helps to force Navalgazer's rearguard-standing skill past the opponent's defenses. His Assault series cards activate their skills in the fourth or greater battle, well supporting Navalgazer's ability, while Algos and Cynthia search the deck for the needed pieces of Leon's strategy. Souryuu later reveals a new strategy, integrating the Storm Rider series of cards that swap positions with the cards behind them after attacking to let him enter third and fourth battles more easily, and as a new main vanguard the 11000-power Blue Storm Dragon, Maelstrom. Maelstrom's own limit break gives him +5000 power in the fourth battle onward, forming a similar 26000-column with Dorothea while just touching 20000 with Erikk, and allowing him to retire an opponent's rearguard while drawing a card if the attack hits and the opponent is still left standing. This exceptionally brutal strategy helps to corner his opponents swiftly, and works even better in the Hong Kong stage's tagfights, where his teammates employ similar strategies. 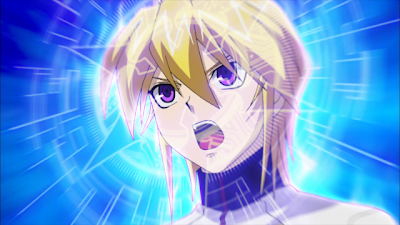 After seizing additional power in order to secure the Souryuu people's freedom and unite Cray, Leon refits his deck to account for his new ace in the hole, the legendary Blue Storm Supreme Dragon, Glory Maelstrom. As the manifestation of a legendary dragon from ancient history that passed judgment on warring peoples, Glory Maelstrom is the ideal form of his Maelstrom avatar card, but as an ultimate break-bearing crossride is slow and difficult to use. 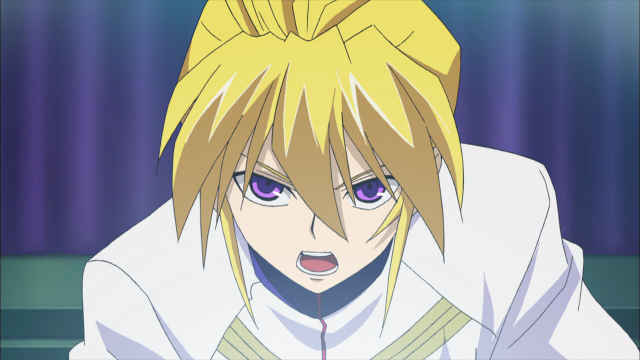 Souryuu, having to cope with holding only one copy of Glory Maelstrom, bases his deck around versatility, support for the original Maelstrom, and the judgment of his wind to guide him to Glory. With Glory Maelstrom's ultimate break, he not only receives the +5000 power of the original Maelstrom, but also denies his opponent the use of grade 1 and higher units for defense, forcing them to block with trigger units while stopping perfect defense cards in their tracks. Unlike any of his previous decks, this one is much more focused toward critical with no stands seen in the Circuit's airing, and to cope with Maelstrom's original form being blocked frequently he relies on Penguin Soldier for added draw power.